Nugget Ice... seriously who the heck calls it "nugget ice?" Maybe I just live in a weird bubble here in Texas or something, but I've always known it as crushed ice. The ice you pop open your Route 44 Cherry Limeade lid to munch on, the ice that takes food spots up two notches when you shockingly and excitedly whisper-ask yourself "THEY HAVE CRUSHED ICE??" Well, now you can make all the nugget ice (just sounds so weird) right on your kitchen counter. The Opal Nugget Ice Maker is rocking it out on IndieGoGo right now and for $400 you can crunch all the nugget ice your brain can take before freezing over. Head on over to their IndieGoGo page to learn more. Well it's about time. HEB is hands down my favorite grocery chain. Their customer service is usually on point and some of their HEB brand products have permanent spots on my shelves(looking at you in-store squeezed OJ). I've been really looking forward to two things from them, contactless payments and a mobile app. Looks like both just went live. The app provides what you'd now expect from a grocery/retail app, including grocery lists, RX prescription services, and store info. Their grocery list has a nifty function that allows you to scan barcodes and codes on receipts to add frequently purchased products onto the list. It also allows you to set up your list based on the location you're at(very cool). HEB is also known for it's chefs and in-store cooking/recipes. The app takes advantage of this and makes those recipes available(including being able to add those recipe ingredients to your grocery lists). They've taken their coupons digitally, for right now they seem to have a login type of system in place but I'm guessing that'll evolve into a phone code scanning function(or NFC tapping) in the future. Overall nice start, but I hope it keeps taking some leaps in the future. An add friends function would be awesome, think of being able to create and share a “Super Bowl Party” list with a few friends and even assign certain items to certain contacts. Parties and get-togethers aside, this function would be great for couples, families, roommates, etc. Create a running family household list, shared amongst family members. Future updates could include giving an option for friends to vote for certain items like type of Meat or Sides. Micro Vids for quick walkthroughs on recipes would be great(helpful tips in general would be nice here too). LIke a recipe? Save it as a meal. Then give the option of entering meals into a weekly calendar to help organize the weeks menu and grocery list. Calorie Info for meals(and food in general) and the ability to share said info in-app with apps like MyFitnessPal or the Apple Health App. It'd be super cool to have the ability to purchase, gift, and use GC's completely in-app. An add to passbook function(including having scannable codes on physical cards purchased in-store). Just a few thoughts and features I'd absolutely love to see and use in an HEB app, tell me what you think below. 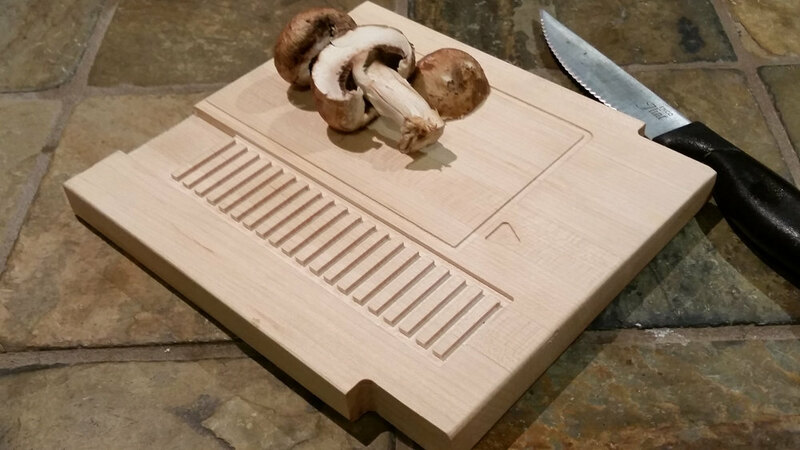 This is a pretty dope cutting board and nice choice on having mushrooms on the cutting board (unlike the choice of putting them on a pizza... ok, ok I'll stop). The cartridge brings back so many memories of the 80's and those mushroom loving Italian bros. I absolutely would not be mad at you for buying this bad boy to just hang on your wall or lay it on your coffee table, in fact I think it's a GREAT idea.